The 2 cup cone size seems to be developing into the de facto standard for single serve coffees in homes and coffee establishments. 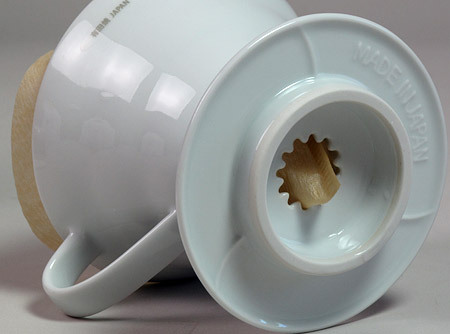 Hario filter holders have a curved, swirl design on the inside to improve coffee flow. Prevents water from simply standing in the coffee bed. This design produces clean cupping coffee and avoids bitterness that is associated with an over extracted brew. Large opening in base of filter aids in keeping flow at a proper rate. This ceramic filter has nice heft to it. Filter cones come boxed and are furnished with a measuring scoop. Paper filters, in packages of 100 are offered separately. When brewing in Hario drippers we recommend that a small stream be poured, first just enough to wet the ground, and left to "bloom" for 30 seconds. Follow that with a thin stream of water, preferably applied in a swirl, and no water placed at the extreme edges where coffee meets filter paper. The Hario Buono kettle, in both stovetop and electric models, are sold separately. They have a gooseneck spout designed to provide a slow, thin stream of water to the coffee bed during brewing. We recommend you consider a gooseneck kettle purchase if you will be using Hario drippers on a daily basis, as they are the kettles capable of providing a slow, steady water stream. Hario filtercones are also available in plastic and glass as well as ceramic in other colors.